• At 8:30 AM ET, Employment Report for January. The consensus is for 158,000 jobs added, and for the unemployment rate to be unchanged at 3.9%. • At 10:00 AM, ISM Manufacturing Index for January. The consensus is for the ISM to be at 54.0, down from 54.1 in December. • At 10:00 AM, Construction Spending for November. The consensus is for a 0.2% increase in construction spending (The December release hasn't been scheduled). • All day, Light vehicle sales for January. The consensus is for light vehicle sales to be 17.2 million SAAR in January, unchanged from 17.2 million in December (Seasonally Adjusted Annual Rate). We estimate nonfarm payrolls increased 180k in January, somewhat above consensus of +165k. … while weather likely contributed to last month’s blockbuster report, January was also relatively warm and dry during the reference week. The BLS has also clarified that furloughed and unpaid government workers will be included in tomorrow’s payroll counts (though contractor layoffs could weigh in some industries). On Friday at 8:30 AM ET, the BLS will release the employment report for January. The consensus is for an increase of 158,000 non-farm payroll jobs in January (with a range of estimates between 140,000 to 183,000), and for the unemployment rate to be unchanged at 3.9%. Last month, the BLS reported 312,000 jobs added in December. Note on the government shutdown: the Federal jobs will all be counted in the establishment report (headline jobs number), since the employees will be receiving back pay. However, the furloughed employees will be counted as unemployed (on temporary layoff), so the unemployment rate will probably increase. Note on Revisions: With the January release, the BLS will introduce revisions to nonfarm payroll employment to reflect the annual benchmark adjustment. The preliminary annual benchmark revision showed an upward adjustment of 43,000 jobs, and the preliminary estimate is usually pretty close. • The ADP employment report showed an increase of 213,000 private sector payroll jobs in December. This was well above consensus expectations of 167,000 private sector payroll jobs added. The ADP report hasn't been very useful in predicting the BLS report for any one month, but in general, this suggests employment growth above expectations. • The ISM manufacturing and ISM non-manufacturing employment indexes have not yet been released..
• Initial weekly unemployment claims averaged 220,000 in January, up slightly from 219,000 in December. For the BLS reference week (includes the 12th of the month), initial claims were at 212,000, down from 217,000 during the reference week the previous month. In general, the unemployment claims suggest a solid employment report. • The final January University of Michigan consumer sentiment index decreased to 90.7 from the December reading of 98.3. Sentiment is frequently coincident with changes in the labor market, but there are other factors too like gasoline prices and politics. The decline in January is probably related to the government shutdown. In January 2017, the consensus was for 175,000 jobs, ADP reported 234,000 private sector jobs added, and the BLS reported 200,000 jobs added. In January 2016, the consensus was for 175,000 jobs, ADP reported 246,000 private sector jobs added, and the BLS reported 227,000 jobs added. In January 2015, the consensus was for 188,000 jobs, ADP reported 205,000 private sector jobs added, and the BLS reported 151,000 jobs added. It appears the ADP report is usually too high for January. • Conclusion: In general these reports suggest a solid employment report, although I expect the unemployment rate to increase due to the government shutdown. My guess is the report will be at or below the consensus, due to good weather in December (some payback in January), and possibly some private sector impact from the government shutdown. First, this report was for November (it was almost ready to release when the government shutdown began in December). The December report will probably be released soon, but no release date has been announced yet. Based on other data, I'd expect sales to be weak in December, but talking to builders, I expect a rebound in January. The "distressing gap" graph shows existing home sales (left axis) through December and new home sales (right axis) through November 2018. This graph starts in 1994, but the relationship had been fairly steady back to the '60s. Private sector employment increased by 213,000 jobs from December to January according to the January according to the December ADP National Employment Report®. ... The report, which is derived from ADP’s actual payroll data, measures the change in total nonfarm private employment each month on a seasonally-adjusted basis. This was well above the consensus forecast for 167,000 private sector jobs added in the ADP report. The BLS report for January will be released Friday, and the consensus is for 158,000 non-farm payroll jobs added in January. Note: The BEA and Census will have a new release schedule soon (getting back on track following the government shutdown). • At 8:15 AM, The ADP Employment Report for January. This report is for private payrolls only (no government). The consensus is for 167,000 payroll jobs added in January, down from 271,000 added in December. • At 8:30 AM, POSTPONED Gross Domestic Product, 4th quarter 2018 (Advance estimate). The consensus is that real GDP increased 2.6% annualized in Q4, down from 3.4% in Q3. • At 10:00 AM, Pending Home Sales Index for December. The consensus is for a 0.1% increase in the index. It has been over eleven years since the bubble peak. 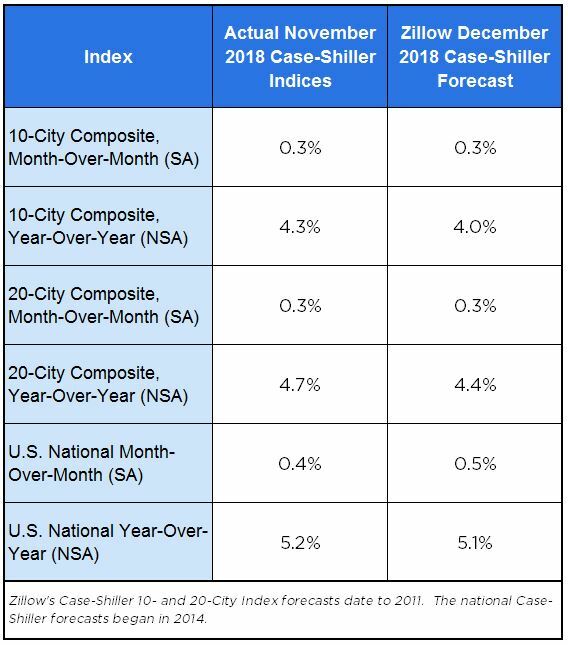 In the Case-Shiller release this morning, the seasonally adjusted National Index (SA), was reported as being 11.7% above the previous bubble peak. However, in real terms, the National index (SA) is still about 8.6% below the bubble peak (and historically there has been an upward slope to real house prices). The composite 20, in real terms, is still 15.0% below the bubble peak. The year-over-year increase in prices has slowed to 5.2% nationally, and will probably slow more as inventory picks up. Usually people graph nominal house prices, but it is also important to look at prices in real terms (inflation adjusted). Case-Shiller and others report nominal house prices. As an example, if a house price was $200,000 in January 2000, the price would be close to $286,000 today adjusted for inflation (43%). That is why the second graph below is important - this shows "real" prices (adjusted for inflation). The first graph shows the monthly Case-Shiller National Index SA, and the monthly Case-Shiller Composite 20 SA (through October) in nominal terms as reported. We look for nonfarm payrolls to grow by 185k in January following a strong gain of 312k in December. We expect private payrolls, which excludes government workers to increase by 185k, implying no change in government payrolls in January. Our private payrolls tracker based on internal BAC data is looking for somewhat stronger employment growth of 232k but we see a few reasons to fade the strength this month. We also see some downside risk to private payroll employment growth due to the partial federal government shutdown. According to news reports, some government contractors have furloughed or laid off private workers while others employers have paused hiring activity during the shutdown. These disruptions may not be fully captured by our internal data as our data present a degree of selection bias, including but not limited to, income levels and geographies (Note that the BLS will count Federal Government workers that are currently furloughed as on payrolls since they will receive backpay). Elsewhere, we estimate that the unemployment rate should be unchanged at 3.9% in January with a risk of it rising to 4% as furloughed workers will be counted as “unemployed on temporary layoff” in the household survey. This mentions two key points: Government jobs on furlough will be counted in the establishment report since the workers will receive backpay, however those on furlough will be counted as unemployed (on temporary layoff) in the household report - so the unemployment rate might increase a little in January (perhaps to 4.1%). • At 8:30 AM ET, Chicago Fed National Activity Index for December. This is a composite index of other data. • At 10:30 AM, Dallas Fed Survey of Manufacturing Activity for January. This is the last of regional manufacturing surveys for January. From CNBC: Pre-Market Data and Bloomberg futures: S&P 500 are down 5 and DOW futures are down 35 (fair value). Oil prices were down over the last week with WTI futures at $53.32 per barrel and Brent at $61.26 per barrel. A year ago, WTI was at $66, and Brent was at $70 - so oil prices are down about 15% to 20% year-over-year. Here is a graph from Gasbuddy.com for nationwide gasoline prices. Nationally prices are at $2.26 per gallon. A year ago prices were at $2.56 per gallon, so gasoline prices are down 30 cents per gallon year-over-year. Apartment market conditions were mixed in the National Multifamily Housing Council’s Quarterly Survey of Apartment Market Conditions for January. The Market Tightness (46) and Equity Financing (50) indexes showed little change in those conditions from October, while the Debt Financing Index (59) showed improving conditions. By contrast, the Sales Volume Index (33) showed further slowing in property sales. Notably, a significant majority of respondents found that recent tariffs have driven up costs across the board and in a variety of markets throughout the country. "While the four indexes each changed somewhat over the last quarter, overall market conditions remained fairly static. Debt market financing conditions improved somewhat over the last three months," said NMHC Chief Economist Mark Obrinsky. "By contrast equity market financing conditions are little changed, as considerable capital continues to seek investment in the apartment sector." The Market Tightness Index increased from 41 to 46. Less than one-quarter (22 percent) of respondents reported looser market conditions than three months prior, compared to 13 percent who reported tighter conditions. Nearly two-thirds (64 percent) of respondents felt that conditions were no different from last quarter. This index helped me call the bottom for effective rents (and the top for the vacancy rate) early in 2010. And it also helped me call the bottom in vacancy rate more recently. This is the thirteenth consecutive quarterly survey indicating looser conditions - it appears supply has caught up with demand - and I expect rent growth to continue to slow. Update: GDPNow model has been updated. The Q4 advanced GDP release is scheduled for next Wednesday, but even if the government is opened this weekend, that release will probably be delayed. On a rolling 12 month basis, inbound traffic was up 1.3% compared in December to the rolling 12 months ending in November. Outbound traffic was down 0.8% compared to the rolling 12 months ending in November. The Federal Reserve Bank of Kansas City released the January Manufacturing Survey today. According to Chad Wilkerson, vice president and economist at the Federal Reserve Bank of Kansas City, the survey revealed that Tenth District manufacturing activity continued to grow modestly, and expectations for future growth remained solid. The month-over-month composite index was 5 in January, similar to 6 in December, and lower than 17 in November. The composite index is an average of the production, new orders, employment, supplier delivery time, and raw materials inventory indexes. The slow and steady increase in factory activity was driven by durable goods producers, particularly wood products, fabricated metals, electrical equipment and appliances, and furniture manufacturing. Month-over-month indexes were somewhat mixed. The production index jumped back into positive territory, while the order backlog index turned negative for the first time since June 2017. Most year-over-year factory indexes eased from the previous month, and the composite index decreased from 38 to 31. Future factory activity expectations remained solid. The future composite index eased slightly from 22 to 18, while the future production index increased. This month contacts were asked special questions about how the partial federal government shutdown has affected their business, and how credit conditions have changed over the past year. Nearly 17 percent of manufacturing contacts reported negative effects from the federal government shutdown on their business. Of the firms that reported negative effects from the shutdown, most noted permit delays or trade disruptions due to federal agencies being closed. Over the past year, more than 13 percent of firms reported that access to credit had increased while only seven percent of firms said access had decreased (Chart 4). However, 54 percent of contacts reported that the cost of credit increased over the past year. So far, most of the regional surveys have indicated slower growth in January than in December (and December was the weakest month for the ISM index in over 2 years). The Chemical Activity Barometer (CAB), a leading economic indicator created by the American Chemistry Council (ACC), posted a 0.3 percent decline in January on a three-month moving average (3MMA) basis. This marks the barometer’s third consecutive month-over-month drop and suggests a slower rate of U.S. economic growth. On a year-over-year (Y/Y) basis, the barometer is up 0.8 percent (3MMA), a pronounced slowdown in the pace of growth as compared with late last year. Architecture firm billings growth softened in December but remained positive for the fifteenth consecutive month, according to a new report released today from The American Institute of Architects (AIA). AIA’s Architecture Billings Index (ABI) score for December was 50.4 compared to 54.7 in November. Despite the positive billings, a softening in growth was seen across several regions and sectors, as well as in project inquiries and design contracts. This graph shows the Architecture Billings Index since 1996. The index was at 50.4 in December, down from 54.7 in November. Anything above 50 indicates expansion in demand for architects' services. According to the AIA, there is an "approximate nine to twelve month lag time between architecture billings and construction spending" on non-residential construction. 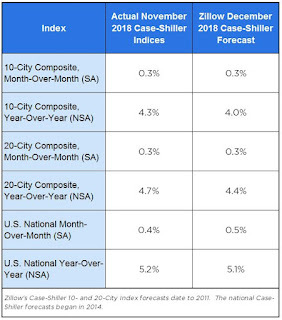 This index has been positive for 15 consecutive months, suggesting a further increase in CRE investment in 2019. This was another weak regional manufacturing reading for January. According to Black Knight's First Look report for December, the percent of loans delinquent increased 4.7% in December compared to November, and decreased 17.6% year-over-year. The percent of loans in the foreclosure process increased 1.2% in December and were down 19.2% over the last year. Black Knight reported the U.S. mortgage delinquency rate (loans 30 or more days past due, but not in foreclosure) was 3.88% in December, up from 3.71% in November. The percent of loans in the foreclosure process increased slightly in December to 0.52% from 0.52% in November. The number of delinquent properties, but not in foreclosure, is down 399,000 properties year-over-year, and the number of properties in the foreclosure process is down 60,000 properties year-over-year. Mortgage applications decreased 2.7 percent from one week earlier, according to data from the Mortgage Bankers Association’s (MBA) Weekly Mortgage Applications Survey for the week ending January 18, 2019. ... The Refinance Index decreased 5 percent from the previous week. The seasonally adjusted Purchase Index decreased 2 percent from one week earlier. The unadjusted Purchase Index increased 4 percent compared with the previous week and was 13 percent higher than the same week one year ago. The average contract interest rate for 30-year fixed-rate mortgages with conforming loan balances ($484,350 or less) increased to 4.75 percent from 4.74 percent, with points decreasing to 0.44 from 0.45 (including the origination fee) for 80 percent loan-to-value ratio (LTV) loans. Refinance activity is close to the highest level since last Spring. The purchase index is close to a 9 year high. After two consecutive months of increases, existing-home sales declined in the month of December, according to the National Association of Realtors®. None of the four major U.S. regions saw a gain in sales activity last month. Sales in December (4.99 million SAAR) were down 6.4% from last month, and were 10.3% below the December 2017 rate. According to the NAR, inventory decreased to 1.55 million in December from 1.74 million in November. Headline inventory is not seasonally adjusted, and inventory usually decreases to the seasonal lows in December and January, and peaks in mid-to-late summer. Inventory was up 6.2% year-over-year in December compared to December 2017. Months of supply was at 3.7 months in December.